"IMF says economic growth may never return to pre-crisis levels"
"The Coming Financial Crisis: Yes Indeed, Another Crash Is Coming, Says Al Lewis"
These recent headlines from The Guardian and Wall Street Journal are similar to many from the last several months. Do they startle you? Do you read stories of that sort? Do they make a difference to your portfolio management approach? Perhaps more importantly, do they make a difference to your business management approach? When asked the latter most folks say "no." And that's reasonable. You can't change or impact the broad economic cycle, so aside from managing your business conservatively to maintain healthy ratios, there's not a lot you can do. You weather the hard times when they come - "battening down the hatches", "hunkering down" or whatever you prefer to call it. But is that really a sensible approach? What constitutes a poor market? Everyone's definition varies, but let's assume a fairly severe recession for the sake of this argument. Let's pick -3% growth. In that "sky is falling" scenario the economy finds itself at the same point it was a year earlier (assuming 3% growth in the meantime) - a level which at that time probably seemed pretty good. Business was clicking along, orders were coming in, you were struggling to get components on time and to find new workers with the right skills. And then suddenly it feels very different - the bottom falls out. But does it really? After all 97% of the same activity is taking place. Business doesn't stop. Spending doesn't disappear and investment doesn't cease. Why does it feel like such a drastic impact on your business? Why is B2B sales growth so immediately and disproportionally impacted? 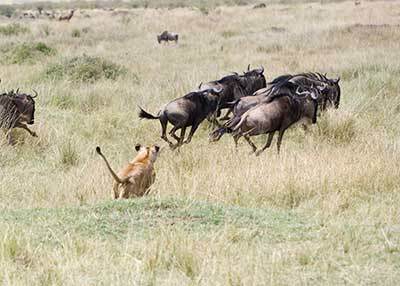 Companies run with the herd just like wildebeest. By "hunkering down" and staying conservatively with the pack, reasoning goes that while unfortunately one or two will eventually get picked off, they were the marginally weaker/slower ones anyway. Is that a B2B sales growth strategy? To graze while the markets good and then to try to blend in and 'survive' when it's tough? And how are we to reconcile that with statistics which show that vibrant business creation occurs during challenging economic cycles? One reasonable conclusion is that companies which blend in as a survival strategy lose ground to those that see the opportunity to separate themselves from the herd - not carelessly languishing behind at the waterhole as easy prey, but rather boldly pressing on ahead, exploring new territory. Clearly buyers are more conservative during challenging cycles. They may measure ROI differently; they may take longer to make decisions; and they may postpone optional investment. But they're also still looking for new customers themselves and investing where they believe it will help them thrive despite the background conditions. The key to B2B sales growth during a tough market, therefore, is to separate yourself from the herd and to provide resources for companies that continue to invest - to help them understand the investments they can & should make in the context of the conservative perspective which they're sure to have during a downturn. If you have products which will legitimately help them grow profitably, reduce cost significantly, shorten lead-times, capture market share, pick off customers from their competitors, etc., they will want to learn more even if they're more carefully vetting investments. But they won't be interested in benefits, much less features. Carrying on about your innovations may let you proudly look in the mirror but won't make a bit of difference to a prospect. Instead content around how your product positively impacted the business of companies like theirs will get their attention; information like case studies and testimonials, presented in the context of an approach to help them achieve growth. But why write about this today? Today's 'gloom and doom' headlines are likely just someone trying to sell some subscriptions, after all, because things are still reasonably good. Fair point - but whether the prediction is premature or too dire, we all know that cycles occur. There will be a downturn at some point, and statistically it's probably not too far off. And there are certain fundamental truths of B2B marketing. The bottom line? There will be a down cycle. Maybe in '14, maybe not until '16, but statistically we're due for one. If you wait to position your business, you'll be stuck running with the herd hoping that you're not the slowest of the wildebeest. But if you start now you'll create marketing, and probably even revenue inertia that will not only carry you through but accelerate your business past competitors who stumble.